RevLine drawings and RevLine document sets provide a unique ability to identify changes with a high degree of accuracy in a minimal amount of time. Instead of manually comparing two drawings, detail-by-detail and dimension-by-dimension, simply request a RevLine drawing and the changes are highlighted for you. This is a huge issue in design and construction. The accuracy of "what changed" is always time-consuming and nasty, every time there is a change. While the ability to capture changes in digital files has existed for years, RevLine is the only application that clarifies those changes for document consumers – the professionals that must plan, build and manufacture from electronic and or paper documents. Click on this image to see a magnified view. Items that were deleted from the original appear in red, while items that were added to the revision appear in green. RevLine drawings dramatically decrease human error. For instance, it's easy to read 4'-8" instead of 4'-6" or 48". One incorrect dimension can cost millions of dollars and leave no recourse. RevLine drawings make those changes jump right out. Reduce liability and mistakes. Capture and track all project changes whether or not they are clearly noted on the revised documents. Save time. Manually comparing drawings typically consumes 15-20 percent of a project manager's time. 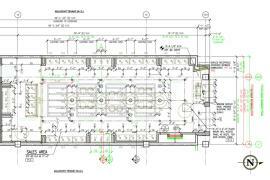 RevLine drawings make the changes immediately apparent and streamline information flow among project members. Add value to the construction process. Your involvement in change management and communication makes you an important partner in the construction process. Create value with color. Highlighting what changed saves your customers time and helps them focus on understanding the impact of changes – not identifying them. RevLine documents demonstrate how color can assist the construction process. Differentiate through your core competency. RevLine document services illustrate your understanding and ability to impact key construction processes. RevLine output enables conversations with higher level customer contacts and gives you a simple tool to show how your services can improve the control and presentation of key project data. Create transparency. RevLine documents identify and track project changes and gives a simple tool that helps avoid mis-communication and finger pointing. Save project time. Back and forth communication and discussion on large impact changes can take days or weeks. RevLine drawings make the changes immediately apparent and allow the project team to focus on implementing them. Improve the end product. Use RevLine services as a part of the quality control process to ensure the all changes are clearly depicted. Clarify changes. RevLine documents can assist with partner communication during design, and can improve communication flow during construction. Increase the clarity of changes to the entire construction team allowing for tighter collaboration and a well executed project. Please review the product comparison chart for a detailed description of capabilities.